The first thing is that you wonder, what the hell is quantum chromodynamics and why do you have to put a quantum surname on it to make it look interesting? Do not worry, it’s not as complicated as it sounds in the title because quantum chromodynamics is only part of the quantum theory that describes one of the fundamental forces and iteractions. Wow, now it sounds a little better but it still sounds quite difficult for many. Well do not worry because it is very simple. Obviously, I hope you remember that, for now, there are four fundamental forces in nature: weak force , strong force , electromagnetic and gravitational . Obviously, then it has been seen that they can be reduced to three: the strong force, the electroweak (which unites electromagnetic and weak) and gravity. Chromodynamics is a way of explaining strong force or strong interaction through a field theory that creates a series of bosons (which as you know are virtual particles) to keep the quarks together and thus form a particle. Let’s collect this paragraph and explain it in a simple way. You know that, for now, the fundamental components of atoms are quarks, they come together in different ways (since there are quite a few different types of quarks) to form protons, neutrons, electrons. The different types of quark ( up , down , strange , bottom , charm) they have to be joined three by three, for example, to form a neutron. And how do three quarks come together, forming a trio knowing that the problem of the three bodies in Newtonian physics is unsolvable?, because to complicate it even more through 3 different types of forces. Are you saying that the strong force is actually three different types of bosons/forces? Yes, exactly. And physicists, we do not have much imagination, we have called colors. Thus, there are three colors, red, green and blue (RGB, as in TVs). Quarks, apart from whatever type ( up, down , etc., called flavor) can also have a force or a color. Chromodynamics is studied in how these interactions between colors work since a quark of one color can only be joined (doubly) to another of the other two colors. To all this, we must add that, like electricity there are negative and “positive” charges, the colors have color and anti color. Then a red quark up corresponds to an anti quark up anti red . These pairs of quark and anti quark of the same color and “opposite” color are only visible when an element of the atom disintegrates. Ah! and just as quarks have color, leptons, being a fundamental part of the material (for now), also have color. 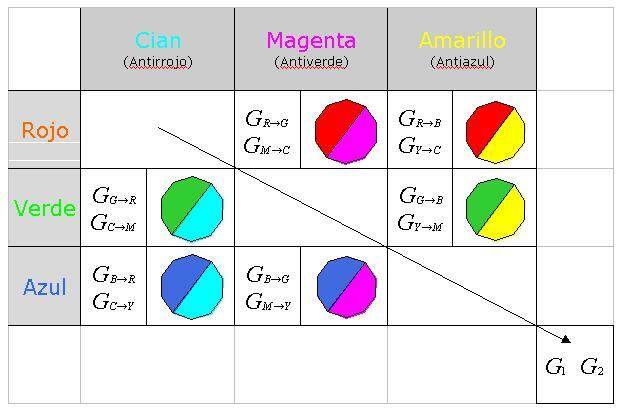 Hence, electrons and their corresponding variants (positrons, muons, antimuons or tau and anti tau particles formed by a quark and an anti quark) to be composed of these, have color. So, knowing that there is a branch of physics that studies all this, how they interact, how they work and try to figure out why these particles have color, quantum chromodynamics is a very fun and exciting branch of physics with its different sub branches such as the thermodynamics of quantum chromodynamics (buf, que lio de palabrejas) that studies the exchanges of energy and its projection in heat of strong interactions according to the color of the fundamental particles. Come on, the thermodynamics of all life applied to something in particular.